Bernie Sanders Abroad: Is a Peace Presidency Possible? For many decades, progressives have looked in vain for candidates who’d be taken seriously on the national stage, while at least starting to come close to representing our thinking. In 2016 that changed. Bernie Sanders energized a grassroots movement that gave the presumptive nominee a real run for her money. He did this primarily by motivating constituencies concerned about economic justice and climate change. His platform for “political revolution,” however, had relatively little to say about foreign and military policy. Perhaps this is because there has been a broad, bipartisan consensus dating back at least to World War II that embraces the role of the United States as the dominant global hegemon, often referred to euphemistically as “leader of the Free World.” Those who step out of this consensus are generally dismissed or ignored. Sanders’ military and foreign policy prescriptions were closer to the Washington Consensus than his domestic agenda and less prominent in his campaign. 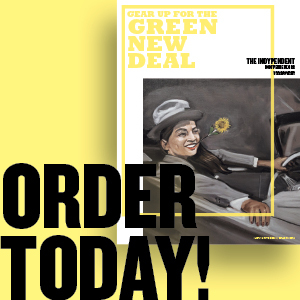 The Democratic leadership has often adopted much more militaristic positions than those embraced by the party’s rank-and-file members and voters. During the Vietnam War most elected Dems were latecomers to antiwar positions and few offered systemic critiques, writing off the war in Indochina as a “mistake.” Bernie, an antiwar activist, questioned the underpinnings of U.S. imperialism. As a congressperson, Sanders spoke out in unequivocal opposition to both the 1991 resolution authorizing the first Gulf War and the 2002 resolution authorizing the Iraq War. While millions of citizens, many of them Dems, opposed both these wars, congressional Democrats were divided, with many in leadership roles voting for the war resolutions. While Sanders, in his 2016 campaign, did call for cuts to the military budget, his military and foreign policy prescriptions were both less of a departure from the Washington Consensus than his domestic agenda, and also far less prominent in his campaign. Is there reason to believe that his 2020 campaign will take a more “revolutionary” approach? Let’s take a look. To date, Bernie has not made addressing the nuclear threat a major focus of his campaign for the 2020 nomination. He condemned Trump’s decision to withdraw from the Intermediate-Range Nuclear Forces Treaty and, along with nine other Dems (including three of his primary opponents, Warren, Gillibrand and Harris), he’s co-sponsored the Prevention of Arms Race Act of 2019, which would deny Trump funding for procuring, testing or deploying weapons that would violate the INF Treaty. While challenging Trump on many foreign policy fronts, from Venezuela to Saudi Arabia, Yemen and Iran, among others, Bernie has praised the willingness of Trump to sit, face to face, with adversaries, including North Korea. Few Democrats have supported such diplomatic efforts, but Bernie seems to be putting principle over party in supporting negotiations. One foreign policy issue where Sanders has taken a major leadership role is pressing for an end to support for the Saudi-led, U.S.-backed war on Yemen, which is the greatest humanitarian crisis today, with many millions threatened with starvation. While working to end the Yemen War, Sanders and his allies are also working to assert congressional oversight, invoking the War Powers Resolution of 1973. While this bipartisan effort is backed by a majority in both houses of Congress, the resolution is likely to be vetoed by Trump. It does, however, indicate that Bernie is in the process of laying out his foreign policy agenda; one that will contrast sharply with Trump’s erratic record. Bernie has, over the past few years, grown increasingly critical of Israel’s actions. He has spoken in favor of addressing the rights of the Palestinians and has condemned the Gaza blockade, as well as the killing of Palestinians in Gaza protests. He also supports the Iran nuclear agreement and is opposed to Israeli Prime Minister Benjamin Netanyahu’s moves toward war with Iran. This said, he supports a two-state solution, which, until recently, has long been the official U.S. position. He supports a robust U.S. diplomatic initiative to seek resolution to the long-festering conflict, while opposing the Boycott, Divestment and Sanctions (BDS) movement that would isolate Israel on the global stage, much like apartheid-era South Africa. The political calculus over Venezuela has been complicated by the fact that the GOP has been conflating “democratic socialism” — the term Sanders has long used to describe his New Deal-style social democracy policies — and the more authoritarian forms of “socialism.” Their strategy appears based on creating a new Red Scare. Trump and company would like nothing more than to smear Sanders, Alexandria Ocasio-Cortez and others on the left with the “sins of Maduro” and the hyperinflation, unemployment, shortages of food and medicine and political repression being experienced today in Venezuela. Sanders supported the post-9/11 authorization of the use of military force that was used to justify the American war on Afghanistan. He subsequently came to favor ending the war and voted against Obama’s Afghan surge. He supported sanctions against Iraq during the 1990s but opposed the invasion of Iraq before it started in 2003 and repeatedly voted against it. He has also pointed to the U.S. war as fueling the rise of ISIS. He likewise has questioned the legality of the U.S. presence in Syria. This noted, he has also criticized Trump for his erratic policies toward these wars, including his on-again, off-again, announcements of withdrawal, and his failure both to communicate with allies and to use diplomatic means to achieve peace. Sanders has been a strong critic of the so-called “War on Terror,” while not rejecting it entirely. In 2016, he confirmed he’d continue, but limit, drone warfare. In a major foreign policy speech in September 2017 he stated: “In addition to draining our resources and distorting our vision, the war on terror has caused us to undermine our own moral standards regarding torture, indefinite detention, and the use of force around the world, using drone strikes and other air strikes that often result in high civilian casualties.” Just how he’d balance this is unclear. Sanders has recognized the shift rightward occurring in many parts of the world and has called for the establishment of an alliance of progressives. While spot-on in its analysis of the need, how he might move this proposal forward remains to be seen. Sanders was an anti-war activist during the Vietnam War and was deeply involved in solidarity work during the 1980s wars in Central America. He unequivocally opposed the disastrous U.S. war on Iraq. His positions might not be as complete a break from established U.S. foreign policy as some would like, but we must ask, can anyone oversee a “peace presidency” while serving as the Commander-in-Chief of the world’s most powerful military? A huge battleship cannot turn on a dime, but, should he win the nomination and the election, Sanders’ “political revolution” would likely result in some major departures from the long-standing Washington Consensus — not perfect, but major steps in the right direction. Mark Haim has been a lifelong activist for peace, justice, sustainability and climate action. He serves as director of Mid-Missouri Peaceworks. 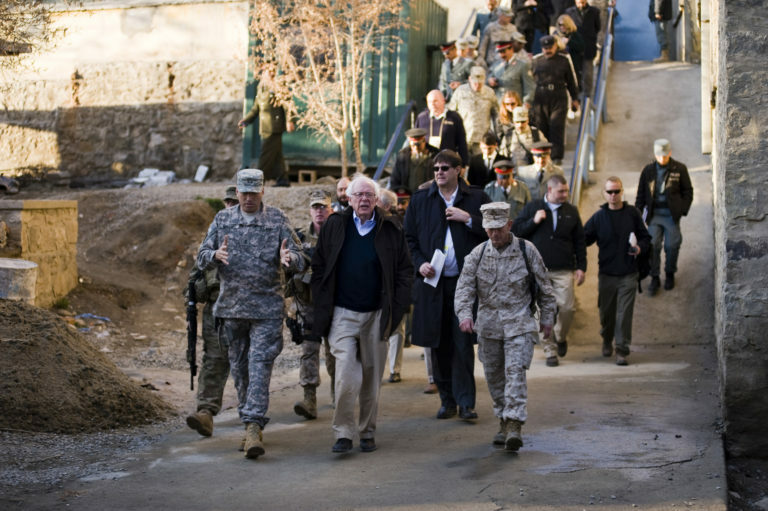 Photo: HOT TO GLOBE TROT: Bernie Sanders leads the pack on a congressional tour of Afghanistan in 2011. Credit: Ernesto Hernandez Fonte.